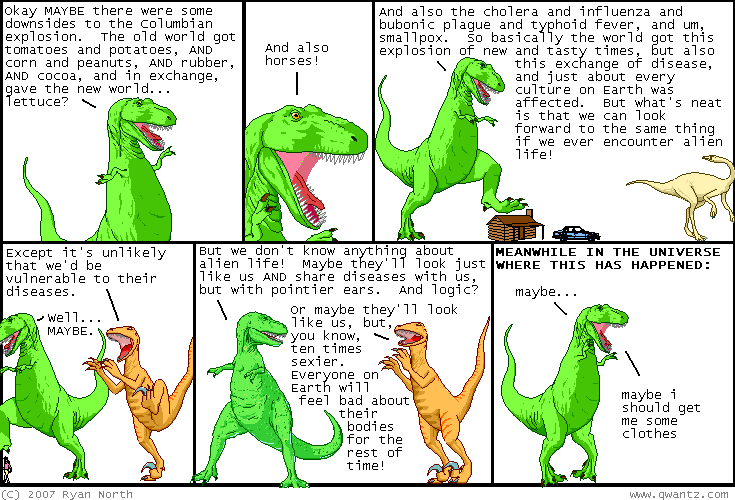 Dinosaur Comics - November 20th, 2007 - awesome fun times! –I helped an old lady across the street and suddenly was $5 richer! November 20th, 2007: Guys the latest Scott Pilgrim book, called "Scott Pilgrim Gets It Together" comes out today! I keep recommending this series but that is because it is class. You can get it at your local comic shoppe or online from the publisher (or from Amazon) and what's this? PREVIEW PAGES ONLINE? You can read the complete Free Comic Book Day Scott Pilgrim issue there too, which gives you a great taste of the series.